Nag Panchami is the Hindu festival honoring the energy that has become this universe. “Nag” (nawg) means snake and “panchami” (pawn-chaw-mee) is the name of the fifth day after the full moon, July 27th this year. In the human being, this kinetic energy is dormant until awakened, lying coiled in the energy center just below the tip of your tailbone. Once awakened, Kundalini arises within you and blossoms you into the Divinity you have always been. This annual holy day honors Kundalini as the serpentine energy, both within the human being as well as in snakes. Even though people in India are not widely familiar with Kundalini and Her association with the snake, Hindus regard it as an auspicious day. The mystical energy within the human being is secret knowledge, so most people are worshipping the snakes, as Hinduism sees everything as being holy. They bring flowers, sweets and do ritual baths with milk and water. Especially Shiva temples have snake murtis, because snakes are dear to Shiva. He is usually shown with a cobra coiled around his neck, indicating that He is the origin and master of Kundalini. 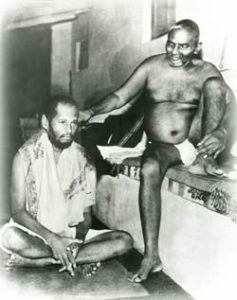 He becomes the Guru in order to make this energy available to spiritually motivated people, who are naturally drawn to yoga’s mystical practices and initiations. Thus, on Nag Panchami, we honor “nag,” the snake, as well as the Guru who has given us the great gift of Shaktipat. You are honoring Shiva, who is arising within you. This is the promise that you will know your own Shivaness. Svaroopa® Vidya Ashram is celebrating Nag Panchami on with a free program Thursday July 27 from 6:30-8:30 am. At Downingtown Yoga & Meditation Center, we’ll begin with the traditional morning chant, “Srii Guru Gita, followed by meditation and a special puja to honor Kundalini. Everyone is welcome for this mystical occasion. OM svaroopa svasvabhava namo nama. This entry was posted in Ashram News on July 27, 2017 by Svaroopa Vidya Ashram. She wanted more. Since there weren’t any teachers nearby, she bought the Primary Practice DVD, started practicing and bought Swamiji’s first book, Yoga in Every Moment. On the website, Cyndi went through all the Freebies, especially enjoying the Shiva Sutra Talks and satsang audios. After 10 months of studying the Svaroopa® Sciences, she felt great respect for Swami Nirmalananda and applied to be a Shishya. Cyndi is in the river, diving deep into the Grace-filled current of the Svaroopa® Sciences. She has an embodied, time-tested way to dive into her Divine Essence, her Own Self, the One Self being All. What’s next? Cyndi wants to become a Svaroopa® Vidya Meditation Teacher and Certified Basics Svaroopa® Yoga Teacher. She looks forward to hosting Foundations to help facilitate spiritual access for people in her area. This entry was posted in Ashram News on July 25, 2017 by Svaroopa Vidya Ashram. I can still see myself listening to Swami Nirmalananda (Rama) teaching about the 36 Tattvas. It was Level 1 of my Yoga Teacher Training in La Jolla CA, way back in 2001. Yet such was the effect that the memory is still with me. It was an astounding revelation. I had previously been studying yoga at a fairly superficial level and was thoroughly confused. That 36 Tattvas talk made all the puzzle pieces of life fall into place. As Swamiji and Vidyadevi say in our July Contemplation article, that Ultimate Map “explains the universe, its source, your life and the purpose of your life.” Here it all was in one map! It was hard at the time to grasp the whole meaning. But it felt right and complete. It was something I knew, not just with my mind, but my whole being. Since then, I have heard the same talk many times and love it still. Each time I hear it or read it, my understanding deepens. When I was in my late teens, I abandoned my Christian roots because they made no sense to me. I spent some twenty years in a spiritual wilderness searching for meaning and understanding about myself, the world around me and my place in it. Suddenly, here it was explained in a form I could understand and relate to. More importantly, it showed to me why I had no “feeling” for God. I was looking for God in the wrong place. That is, outside rather than inside. 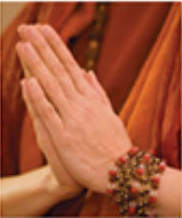 When I came upon Svaroopa® yoga, I had already been practicing yoga for more than twenty years. I had gone to many classes, even in different countries and cities. Yet I did not recognize it as a spiritual practice. It was not really taught to me as such, though I enjoyed many other benefits. As the article says, “Every yogic system shares this exalted purpose [to recognize who you really are], even when their practices are misunderstood as mere exercise or stress relief.” I was doing some kind of yoga and Grace was at work. Twenty five years later in YTT 1, I was ripe for the download, after “the twenty or more years of poses, hoping for an inner revelation.” I now realize I received spontaneous Shaktipat during YTT 1. No doubt that helped me absorb the download of the 36 tattvas. It led to me experiencing the tattvas at many levels of my being. When meditating, I frequently experience timelessness, piercing kaala, so that I have no idea how long I have been there. Time does not exist. Also, I recognize the Divine in all things without my mind being caught up in anything at all. Complete freedom. The 36 tattvas talk was a turning point for me. It gave me both the understanding and the help I needed to go deeper within my own Self. The 36 tattvas have unfolded for me, becoming much more than merely a map on paper and more than merely grappling with them in my mind. It is gradually becoming a consistent inner experience. I continue to contemplate the 36 tattvas in the context of my life, both inside and outside. All has been given to me through the Grace of my Guru. That help continues too, without conditions, without pause and with steadfastness and love. For that I am eternally grateful to Swamiji and her lineage. This entry was posted in Ashram News on July 18, 2017 by Svaroopa Vidya Ashram. Shaktipat from Swami Nirmalananda awakens your Kundalini, so the inner force continues to arise within you. Bhadra says, “I now know that Kundalini is at work even when I do not feel it directly. I now see results, even though I have not been experiencing the kriyas I used to depend on as a sign of change. I am practicing being present in all that I do. 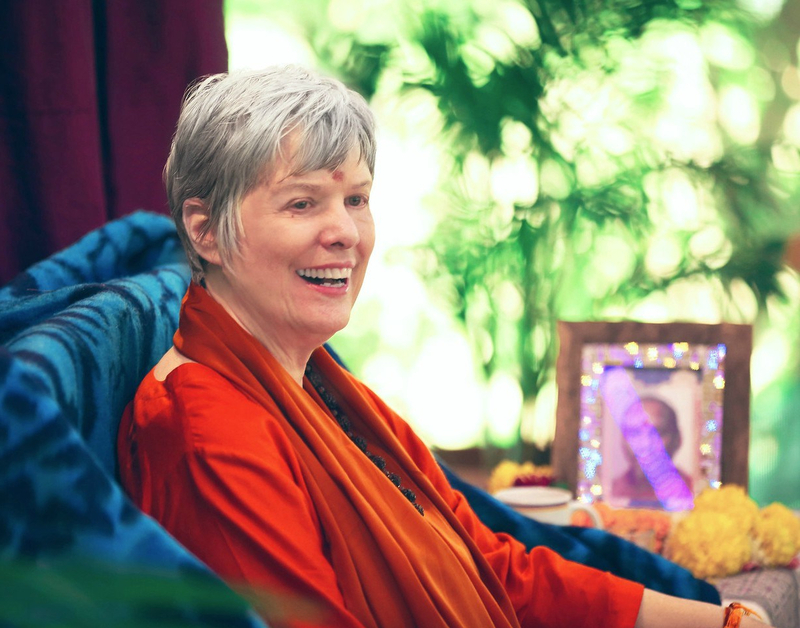 My heart feels infinite love towards Guruji for all she does for us.” Swami Nirmalananda responds that the end of the kriyas means there’s been a big shift! This entry was posted in Ashram News on July 11, 2017 by Svaroopa Vidya Ashram. Today is the full moon dedicated to the Guru, per India’s ancient tradition. Guru Purnima is the day that the flow of grace is fullest, most easily accessible and most powerful. Grace is the power of revelation, giving you the highest, the knowing of your own Divinity. The world honors astronauts, celebrities, athletes, billionaires, and winners of the Nobel Peace Prize, yet most people focus on taking care of their family, taking care of their body, and living a long, happy healthy life. All of these are great things, if they are what you want to do. Whatever you do, when you breathe the last breaths in this life, hopefully you have your nearest and dearest around you. If I were one of them, I’d ask you, “Did you do what you came here to do?” What will you say? Yoga says, if you don’t attain the highest in this lifetime, you get another chance. You can come back and do this as many times as it takes you. The fact that you are now alive means that you didn’t make it last time, so you had to repeat the grade. Will you make it all the way this time? Say, “Yes.” Please say, “Yes.” The world needs more enlightened beings! Of course, if you decide to undertake this Divine Mission, you have some work to do. It’s inner work, for your Divinity is hidden within you. Who and what will you be when you become Self Realized? Is it going to change your life? The short answer is yes and no. The change is an inner change, making you free from fear, free from self-doubt, free from enmity, full of joy and love, overflowing with compassion and the impulse to give to others. But you can still live in the same place, do the same things and share your life with the same people. They probably won’t notice a change in you, as you would have been changing all along. You’ve been getting lighter, happier, more clear-headed, more practical as well as more creative and insightful. Yoga’s practices guarantee this. Plus, you cannot really tell anyone that you’re enlightened. It’s a Catch 22. If you announce that you’re enlightened, you take on the persona of being enlightened, which makes you trapped in a persona, thus not enlightened. So, it’s a Divine Secret. Only those who are appointed to uplift others are openly recognized and acknowledged as Self-Realized Beings. I lived and studied with such a Master for almost seven years. There’s nothing else like it! Whatever you think enlightenment looks like, actually seeing it in person is a different thing. For me, it was like comparing Cinderella at the ball to the reality of getting married. It’s earthy. It’s real. Gurus are not phonies. Seeing the Divine in action, being human, is going to shatter your concepts. They need shattering. Think of it this way: when you become Self-Realized, will you still eat? You will still have a body, so you’ll eat, drink, sweat, excrete, speak, walk, talk, sleep and maybe even snore. You’ll still have to take care of your body, for as long as you have one. That’s the point! To be free while in the midst of life, to be consciousness-incarnate, embodied consciousness. To bring the best of yourself into every action, every relationship, every breath of your life — you always wanted to be this way. To shine with the inner light that you know is there, this is your future. To blossom into the fullness of your innermost essence is the reason you took birth. To be and to share the Divine in the mundane, what a way to live! Can you see the possibility for yourself? Is this something you can grow into? But you deny the very same possibility to others by denying that someone other than you could have made it. You debunk the whole idea of a Guru, when that’s really the only person who can help you get enlightened. You cannot learn to play the flute from someone who’s never played, nor from a book. Even if the book was written by a flautist, you cannot learn to play from a book. If you want success in the business world, you get a mentor. You want one who has been successful in their career, not one who hides in the back office. If you want to attain enlightenment, you need to look for an enlightened being. My Guru told us, “The way you become enlightened in this lifetime is to spend enough time with an enlightened being.” What is “enough time?” Probably it’s more than you have already spent, unless you are already enlightened and were keeping it a secret. Every religion was founded by such a person, a Divine Human. They were so inspiring, uplifting and transforming that people were attracted to them. When Siddhartha Gautama became the Buddha, he could not stay in one place for long; so many people came that the area ran out of food within a few days. Some kings closed their borders to the Buddha because his travel through their kingdom would bankrupt it. Yoga focuses on living Divinity, embodied consciousness. While the Roman Catholic church doesn’t recognize saints until they’ve been dead for decades or centuries, there were people who knew them. Their testimony is what makes the church able to determine that “that person had been a saint when they were alive.” But the people who knew them got to spend time with these Divine Beings. What about you, wouldn’t you like to know one? Today is the day we honor the Guru. Yoga wouldn’t be so popular in the USA if Gurus hadn’t brought it to us from India. Even if you think it’s merely an exercise or healing system, it came from Gurus. It’s time to honor the source. I owe everything to my Baba. I live in ever-growing gratitude and perpetual service to Him and to all whom He sends to me. This entry was posted in Ashram News on July 8, 2017 by Svaroopa Vidya Ashram. Guru Purnima is the most important yoga holiday, celebrated on the fullest full moon of the year. This is when Guru’s Grace flows most generously and our practices bear the most fruit. This day you renew practices received from your Guru as well as look for an opportunity to give back to your Guru. Experience the luminous power of Grace, shining on this fullest of full moons, dedicated by the ancient sages to the Guru. The moon has always been a mystical presence in my life. As a child. I would stand at the window and gaze at the moon. In all aspects, waxing and waning, it was beautiful and mysterious to me. When full and bright, it was most captivating. Gazing at its fullness, I felt fullness in my heart. Before finding Svaroopa® yoga, I joined the Algonquin Medicine Society and became a member of the Moon Lodge. Our responsibility was to celebrate each of the moon’s 13 cycles. In the Abenaki language, each has a name. Two refer to the moon as teacher. Nokomes means grandmother, offering wisdom and guidance to all of her earth children. As Kesos, “little sun,” the moon reflects the sun’s light upon the earth to guide us through the darkness. Now as a Svaroopi, I discover that my dear old friend, the moon, had always been heralding the coming of my Guru. 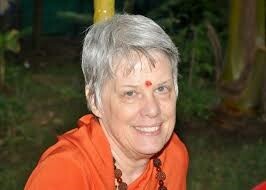 She is the profound and pervasive teacher for Self-Realization. She is giver of the upwelling Light of Self. The light of Consciousness shines through her in a way that is accessible to all – especially on Guru Purnima, when Guru’s Grace shines the brightest! I am immensely grateful for this holiest of days, for her guidance on this supreme path and for her presence in my heart. 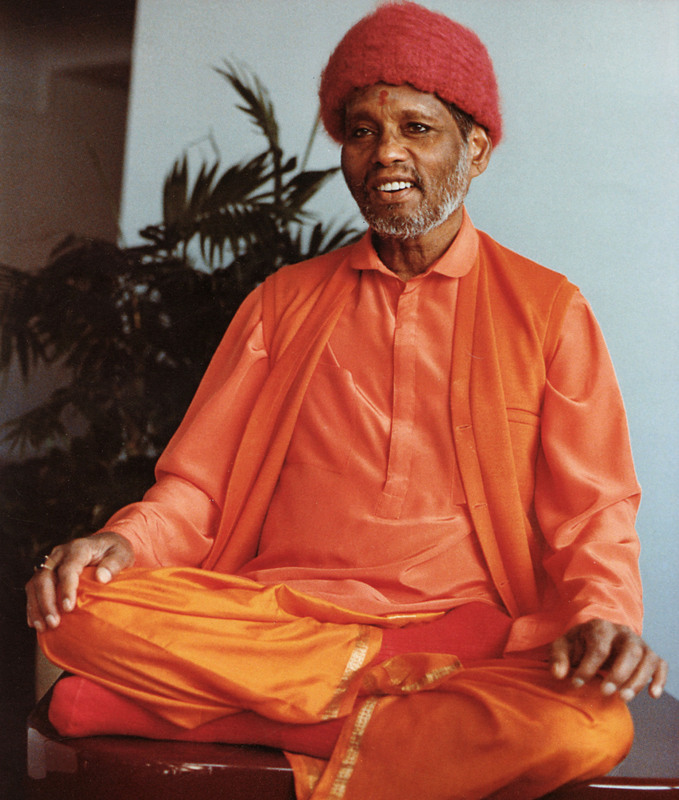 I will be celebrating Guru Purnima on Sunday, July 9th, with Swami Nirmalananda in Downingtown PA. I hope you will be there, too! If not in person, be with us on the free Swami Connection conference call. Swamiji will shower us all with Guru’s Grace and her blessings. Register now to get the conference call number and access code. This entry was posted in Ashram News on July 6, 2017 by Svaroopa Vidya Ashram. I love America’s 4th of July celebration! Certainly the events are fun, but it’s the principle underlying it that is most meaningful to me — Independence Day. When the American colonies declared their independence from Britain, what were they claiming? What was their motivation? What could bring together so many leaders, who lived so far apart (based on travel times in the 1700’s) and had such different lifestyles? Money. Their primary complaint was “taxation without representation.” There were other things they didn’t like, but money underlay most of their complaints. Is that what freedom is about, the freedom to spend your money on what you want? The average American lifestyle seems to prove out this theory. If actions speak louder than words, what are most people doing? Shopping. Now we not only have Black Friday but Amazon Prime Day is vying with it for prominence. It’s about how much you can get, not about how much you can give. It’s about how much you own, not about how much you care. It’s about how much you depend on things for happiness, or depend on other people for your happiness. It’s about dependency — not about independence. You may have noticed that I didn’t complete the last phrase with “and the pursuit of Happiness.” That’s because the pursuit of happiness is not an elevated activity. Elevated means uplifted, and most people pursuing happiness are not pursuing uplifting things. In addition, the Founding Fathers couldn’t conceive of liberty for everyone; minorities, including women, were not meant to be included, not until constitutional amendments were enacted for each. So their motivations were crass, they were exclusionistic and opportunistic, not to mention greedy and prejudiced, but they cited a high philosophy. Most of them were well educated, which meant they knew Greek, Latin and Hebrew, and read the classics as well as the Bible in its original language. Their studies usually included Plato and Aristotle, as well as other philosophers, giving them elevated principles, whether or not they were able to apply them to everyone at the time. But they didn’t study Sanskrit. They had never heard that they would find freedom inside, by finding God within. They didn’t seek liberation, only independence. As a child, I was inspired by the early settlers who immigrated so they could practice their religion, like the Pilgrims in Massachusetts. The settlers who appeared to be looking for wealth didn’t inspire me, so I paid little attention to the history of Jamestown. I loved the frontiersmen, who seemed to be seeking freedom from the tyranny of society. The Founding Fathers spoke of higher principles, the most elevated I’d found in any of my first twelve years of formal education. Yet I wanted more. Buddha’s teaching that life is suffering was instantly understandable to me, but the path offered by Buddhism sounded just as restrictive and painful as what society offered me. Only yoga gave me a way out, which turned out to be a way in. It was Muktananda that made the difference for me, giving me Shaktipat. That gift showed me a possibility that I’d never heard of before – truly the promise of liberation. True freedom! Freedom from the tyranny of my own limited sense of self, to experience my own Divinity. Freedom from locking down my heart into conditional love, to experience Divine Love for all. Freedom from depending on others to give me a sense of self-worth, by experiencing the depth and vastness within. Freedom from being defined by others’ expectations and needs, and freedom to meet both, but for a different reason and from a deeper inner reservoir. Yoga promises freedom, not independence. I still pay taxes. I vote in elections. I’m a good citizen, participating in the benefits that our society offers and contributing to them. I’m not a rebel anymore, because I’ve found my Self. I don’t need to create a sense of self by matching what others do or by rebelling against that. I am me. Free. And I still love the 4th of July! It holds the hint of the promise of freedom. For a yogi’s “pursuit of happiness” is the inner exploration of her own Divinity. Do more yoga. Discover your Self. This entry was posted in Ashram News on July 4, 2017 by Svaroopa Vidya Ashram.